After struggling to find a spot in the rotation in Oklahoma City, Domantas Sabonis is striving in Indiana under the helm of Nate McMillian. It’s been two years since he’s found himself a new home in Indiana, but Domantas Sabonis hasn’t forgotten. How could he? It was all anyone in sports media could talk about that summer. The Oklahoma City Thunder had just traded him to the Pacers alongside Victor Oladipo in exchange for Paul George, and commentators and analysts across the nation made sure he knew that the Thunder had won the trade. That Sabonis was merely a side piece. A throw-in. An afterthought. Today, the rest of the nation knows it, too. 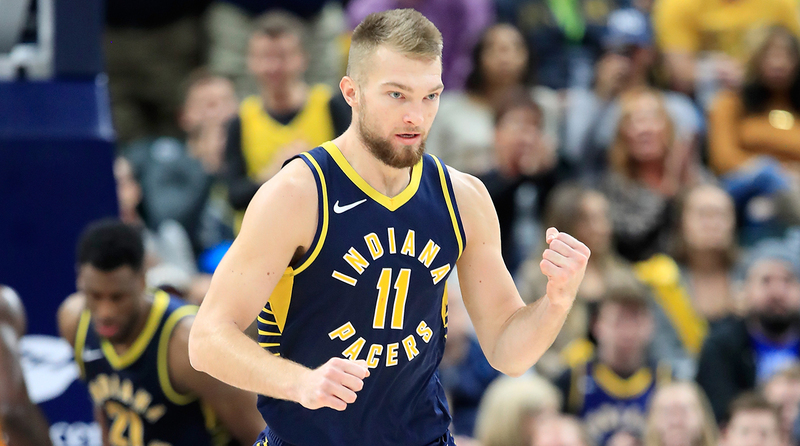 After struggling during his rookie season with Oklahoma City, Sabonis proved himself a valuable sixth man for the Pacers last season, and he did it from the get-go. Sabonis scored 16 points on 7-for-7 shooting in his first game as a Pacer and had an 18-point, 12-rebound night three days later. He finished the season averaging 11.6 points on 51.4% shooting and 7.7 rebounds per game while racking up a team-high 15 rebounds. In 2018, the 22-year-old has further come into his own. Sabonis started out the season with two straight double double performances against the Grizzlies and Bucks and has six so far this season. He matched his career-high with 30 points in a 107–101 win over the Knicks on Oct. 31 and became the first player since Dwight Howard in 2010 to go perfect from the field on 12-for-12 shooting. Sabonis is currently averaging 13.8 points, 9.5 rebounds and 2.7 assists in 24.4 minutes per game. He’s shooting 67.8% from the field, 50% from beyond the arc and 76.4% from the free throw line. His monster start has him second in the league in true shooting percentage (71.3) while setting career highs in rebounding, assists and block percentages. He’s ferocious. He’s relentless. And he’s finally able to show it. It’s been a blessing for the Pacers, too. Sabonis was able to make the team feel like home. After being drafted 11th overall in the 2016 NBA draft by Orlando and then traded to Oklahoma City, Sabonis was forced into the starting lineup of a team that had undergone shocking changes. He started 66 games but felt underutilized. Thunder coach Billy Donovan turned Sabonis into a stretch-four with Steven Adams manning the middle, forcing Sabonis out of his element. He finished that rookie season with just 5.9 points and 3.6 rebounds in 20.1 minutes per game, and by the time the Thunder met Houston in the playoffs, he was nearly forgotten. Sabonis played a total of six minutes in the first two games of the series, scoring just four points on free throws. He didn’t play at all in the final three games. It was during that series that Sabonis recalled sitting on the bench wondering if he would ever have his breakthrough. He was a Gonzaga product coming off of a strong sophomore campaign where he averaged 17.6 points and 11.8 rebounds per game, and he felt like he had more to prove. That’s what Sabonis is currently doing under coach Nate McMillan’s preferred system, a movement-oriented offense that’s more difficult to scout and defend. Sabonis is accounting for 19.2% of the Pacers’ total rebounds (eighth-best in the league) and is one of eleven players who has shot above 75% in the restricted area on at least 45 attempts (Sabonis is shooting 79.7). Sabonis has also refused to let his size confine him. At 6’11”, 240-pounds, Sabonis can make plays anywhere on the floor. He can set rock-solid screens for guards on the perimeter, and he can lead dribble-handoff actions to give his offense some freedom. He can slip to the foul line and catch in open space, and he can make proper reads and make bounce passes off the dribble to teammates cutting backdoor. He’s a smart, decisive ball-handler, and thanks to the freedom McMillan has allowed him, Sabonis is able to tap into the Lithuanian fighting spirit he believes has been the cornerstone to his recent success. GOLLIVER and SHARP: Should Durant join the Lakers this summer? Part of that “do whatever it takes” mentality is the reason Sabonis doesn’t spend much time questioning McMillan’s way of playing him. While others are calling for McMillan to experiment with having both Sabonis and fellow center Myles Turner on the floor together, Sabonis is content with McMillan’s plans. That doesn’t mean that Indiana has no room for improvement. In fact, Sabonis strongly believes the opposite is true. Despite the emphasis McMillan has placed on playing fast, the Pacers are ranked 28th in the league in pace. The Pacers have fallen into a habit of letting opponents go on big runs, often forcing Indiana to play catch-up. Sabonis believes it’s only a matter of time before his team finds a way to play a consistent 48 minutes, before his Pacers aren’t considered secondary to the Bucks or Celtics or 76ers. And when that happens, Sabonis will surely be a big part of it.